Five years ago Dana Bauer and I started the Philadelphia chapter of Hacks/Hackers. She thought there would be interest in bringing together journalists, techies, and data lovers to share stories and learn from each other. She was right. There continues to be enthusiasm for figuring out how technology and journalism can help our community. Have a co-organizer. It is essential to have at least one co-organizer, and possibly even a small committee. It helps share the work, think through ideas, and keeps you accountable. In addition, it's great to have co-organizers with connections to different communities. Dana was well-connected in the tech sector, whereas my connections were more in the journalism community. Collaborate with other meetups. Make the organizing work even easier by co-hosting events with other organizations. It can help reach a new audience, cut down on the organizing logistics, and bring expertise to your community. Dana was also an organizer for Philly Python Users Group, which made it easy to organize. We mostly stuck to closely related groups like the local Code for America brigade, open data, and mapping groups. Take advantage of other events. Nothing like a news hook for getting a meetup off the ground. A local event can be a great way to build excitement--Philly Tech Week is always a busy time here. A national event that happens to be in your town can be a great hook to either share work or just have a social event so people can welcome the out-of-towners. Also, those out-of-towners are potential speakers who may bring a new perspective or expertise to your group. Events elsewhere are also great fodder for a meetup--invite a couple folks who attended a conference to share what they learned. Build on existing resources. There may already be journalism groups in your area that have a budget for trainings and would love to share more technical skills with their members. Organizations like OpenNews have supported journalism tech events around the world, and we're not the only ones. 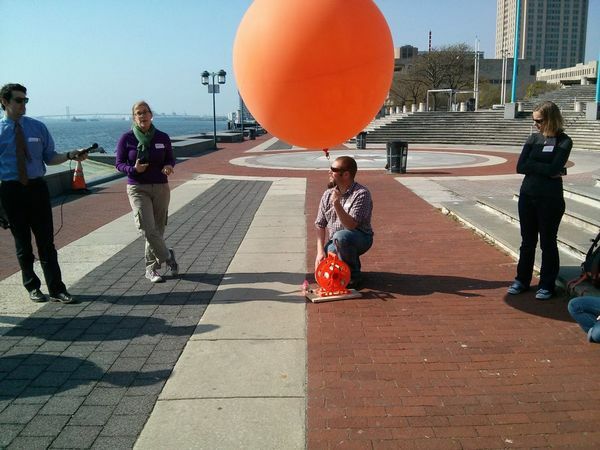 Dana organized a balloon mapping workshop with resources from the Public Lab, which included tools and planning support. You don't have to start the planning for every event from scratch. Remember the people. Thinking about the details goes a long way to sustaining a healthy, active community. If you have food, make sure it's not literally pizza and beer, but has non-alcoholic and diet-inclusive options. Ensure that speakers are representative of your community. Consider different times and formats of meetups so people with different family and schedule needs can participate. And don't forget to invite people. Especially when starting a chapter, or rebooting, personal invitations are critically important. Meetup's automated emails are pretty convenient, but easily ignored. Reaching out to your friends, colleagues, and broader network will certainly increase attendance, plus it's just nice to get to hang out with your friends talking about cool stuff. And as you think about the participants, also be kind to yourself. A lot of Hacks/Hackers chapters go through busy and quiet periods as the lives of the organizers change, or when organizers move away. That's ok. Momentum of regular events is really fantastic once you get into the swing of it, but if you suddenly look up and it's been 6 months since your last event, trust me. You're in good company. If you're looking to get started or re-start a chapter. Go ahead and start slow. Maybe a social event. Or a reportback from a conference. Your community members will probably have ton of ideas after they see the chapter is moving, and hey, maybe one of them will even join in on the organizing fun. Best of luck! Thanks to Paola Mosso for encouraging me to write this post. Thanks to Dana for being such a wonderful friend and collaborator. And if you don't want to stop at a meetup, never fear, I also have a guide to organizing a whole journalism hackation.